Michael Brown, the prominent charismatic prophet (that’s what you call someone who gives prophecy), architect of the Brownsville “Revival,” and host of the Line of Fire, was recently excited when someone sent him “prayer mats” stylized after occultic and superstitious prayer practices. Gipsy Smith – who is mentioned by Brown – is responsible for the “start the revival in this circle” analogy often heard by traveling evangelists. Rodney “Gipsy” (it was spelled “Gipsy” by Smith; not Gypsy) Smith was a British evangelist and a member of the troublesome Salvation Army denomination (until they kicked him out for accepting personal gifts of gold jewelry). A widower at 78, Smith made headlines for marrying a 27 year-old. Smith might best be known for the illustration he often gave as a famous evangelist, in which he would draw a circle around himself with a piece of chalk while preaching and pray that revival start with him, inside the circle. He would exhort people to do the same. Smith was indeed raised a gypsy (or “Roma”), the transient people group known for their eccentric practices and bartering of specific goods, often traveling in caravans of family units across various locations in Europe. Stereotypes (fair or not) of Gypsies include tendencies to swindle or steal, and also to engage in mystic or superstitious practices. Religiously, Gypsies were once “godess worshippers” in their very early days in Europe, but have since converted to the dominant religions of the nations they travel, including Catholicism, Protestantism, and even Islam. However, Gypsies tend to maintain their superstitious practices and wed their pagan beliefs with the adopted religion of their country. Holdovers of Gypsy superstition include use of pagan terms to describe God (del), the devil (beng), bad luck (bibaxt), evil spirits (mulo), and a strong belief in superstitious good luck charms, talismans, amulets, symbols and fortune-telling. One such Gypsy superstition was the use of circle-drawing. Gypsies would (and in many cases, still do) draw circles around themselves or their homes or property in order to give protection or blessing for what is inside the circles. The circle (often made with chalk, sea salt, red thread or corn meal) is believed by the Gypsies to ward off negativity and bring tangible good luck blessings. In fact, there has been a recent revival of ancient Gypsy religion as of late, and with it, has come a renewed interest in circles as superstitious religious imagery. Smith was saved after the conversion of his father, who received the Gospel in prison. And, true to his heritage, the circle-drawing concept came straight out Gypsy religion, although “Christianized” in his evangelism efforts. While Smith may very well have been an authentic convert to Christianity, the circle-drawing analogy was not taken from Scripture, but from the pagan superstition in which he was raised. Although many might not be aware that the oft-used illustration from Gipsy Smith is a pagan hold-over, a Bible scholar like Michael Brown should know that this circle-drawing nonsense does not come from the Holy Bible. But then again, Strange Fire seems to be of no concern to this leading charismatic figure. 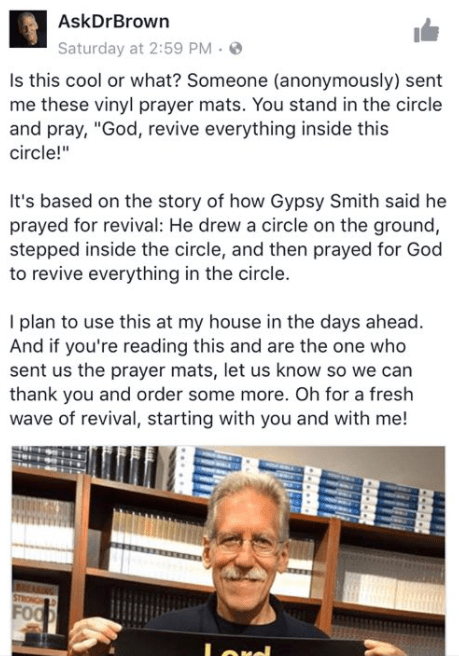 Mark Batterson, who has cashed in on (and is largely responsible for) the occultic renewal of circle fixation, also points to Gipsy Smith as one responsible for the “start a revival in this circle” nonsense, apparently not realizing that it was the Gypsy in Gipsy Smith that led him to normalize such syncretistic superstitious practices. Batterson’s original muse for The Circle Maker was not Gipsy Smith, however, but was a Jewish mystic named Honi Ha-Ma’agel. The point is, drawing circles or entering into circles for prayer comes from mystic superstition and not the Holy Bible. It is, in effect, closer to voodoo than to Biblical Christianity. But that makes sense, considering that charismaticism is closer to voodoo than to Biblical Christianity.